As always, it’s not just what’s inside that matters; the Vario’s smooth operation carries over from internal to external, with front-mounted, easy-access control units, an 8 oz. grounds coffee collection bin, and Baratza’s exclusive PortaHolder for hands-free grinding into an espresso machine portafilter. Burrs: The Vario’s 54 mm professional ceramic flat burrs produce accurate grinding, high throughput and remain sharp for twice as long as the highest quality steel burrs. The Vario grinds 1.6 grams/second at Espresso and 2.2 grams/second at Press. The broad range of grind (230 microns to 1150 microns) and the narrow particle distribution (lack of fines) are the hallmarks of the superiority of the Vario burrs. Digital Control Panel: The front mounted control panel with LED display is easy and intuitive. Three programmable buttons allow for grind time setting within 0.1 second (about 0.2 gram). Simply press the START button and the Vario automatically delivers precise dosing. Grind Adjustment: The Vario offers macro and micro adjust for fine tuning with ease. The macro adjust moves from espresso to press pot in 10 distinct and repeatable settings. A secondary micro adjust arm further divides each of the 10 macro steps into 20 distinct settings. These steps enable you to dial in the exact grind for the perfect shot. 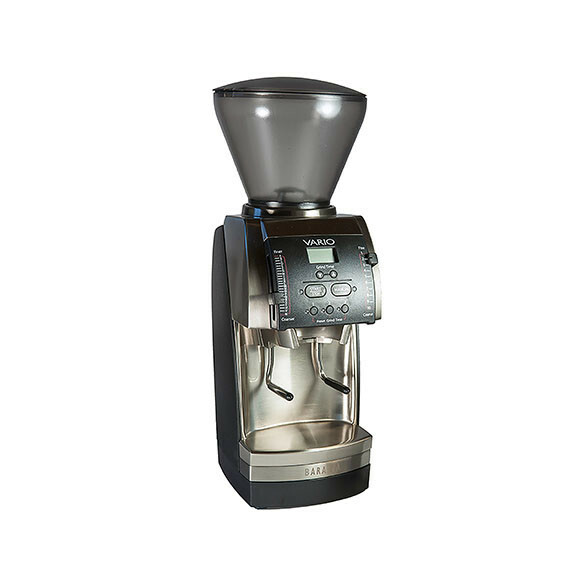 Grinds Left in Grinder: To maximize freshness, the Vario minimizes the ground coffee left in the grinder. Brewing Methods: The Vario is exceptional for espresso and manual pour brewing methods. Calibration: The Vario is calibrated at the factory to ensure an accurate range of grind. If necessary, the Vario burrs can be easily calibrated using the special calibration tool that comes with the grinder. Portaholder: The Vario comes with the Portaholder which permits hands-free grinding into an espresso portafilter and makes clean up a snap. The regular 8 oz. grounds bin is also included.